I finally got around to seeing The Avengers, after watching all the lead-up Marvel films (here and here). Even though some of those were painful to sit through, I'm glad I did, because it made all the character interactions that much more meaningful and fun to watch in this film. 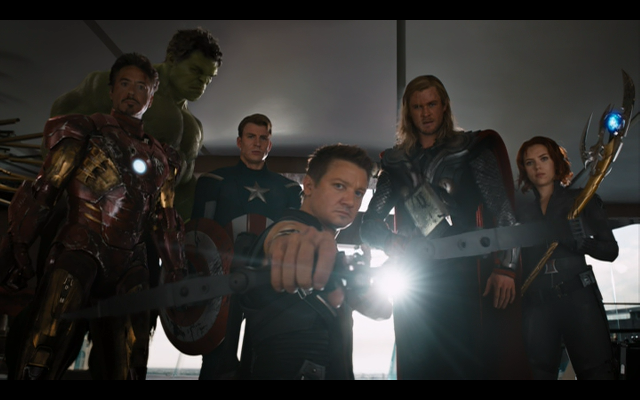 Avengers isn't anywhere near the caliber of The Dark Knight, but it's fine as a feel-good action flick. It's reminiscent of the Final Fantasy VII movie, because the payoff is in seeing some of your favorite characters come onscreen and tear things apart. I'm still underwhelmed by Mark Ruffalo's Hulk, which doesn't surprise me because he's never impressed me much as an actor (though I confess to crushing briefly on him after 13 Going on 30). I don't get his appeal now, and I think he does thought-provoking , small-role films like The Kids are Alright much better than he does large-scale action. You can practically see him trying to act cool throughout Avengers, with his broody-but-not-really expression on the whole time. I remain sorely disappointed by Marvel's decision to not keep Ed Norton, as it not only lost them a great actor who embodies Hulk but also an opportunity to tie back to another film in their franchise. What I did like were all the intro sequences, which managed to feel true to their source movies. I have to give the director kudos for that. 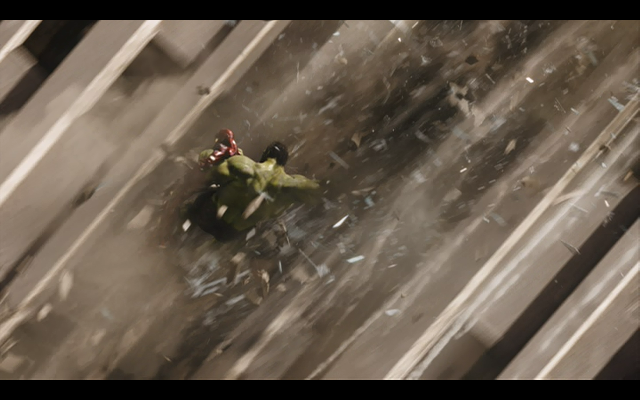 For instance, Hulk's intro with its fast-tempo music and meandering shots were a direct callback to the opening sequence in The Incredible Hulk. 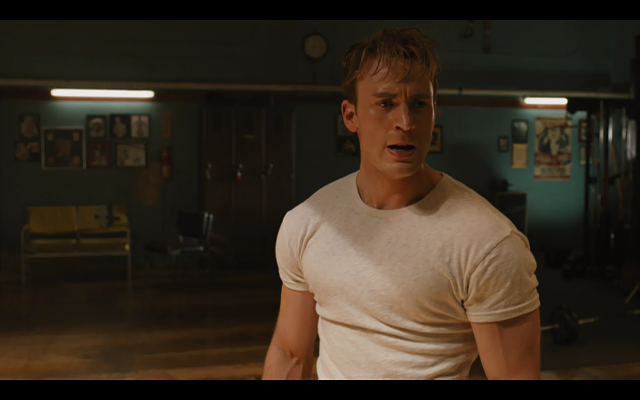 Similarly, Captain America's boxing scene had the same soft lighting and muted colors as his film, while Iron Man kept its roaming camerawork and quick-witted dialog. 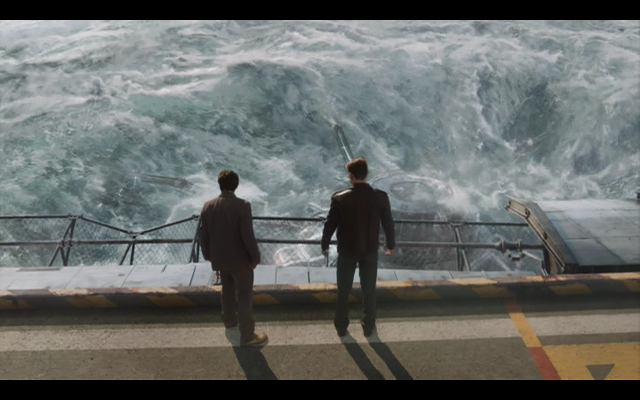 I'm also happy that they tried to make this into an actual part of the individual avengers' film timelines. 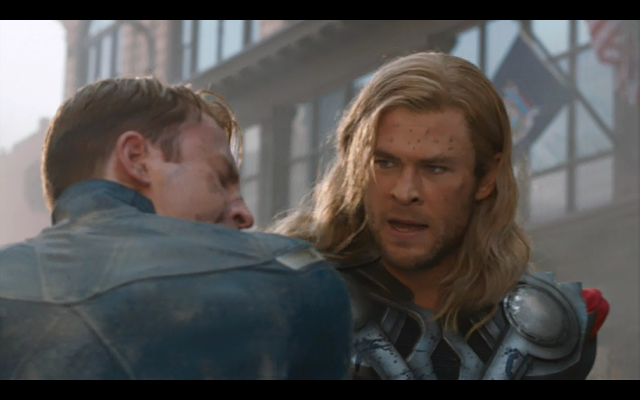 Captain America is still adapting to the modern world, while Thor makes sure to inquire after Jane's safety. The only one floating in limbo is Hulk, again for reasons related to the actor flip. The connection is nice, because it allows us to see that this isn't just a film operating within its own confines, but rather a thought-out story encompassing aspects of all of the previous tales. The plot is standard save-the-world stuff, but at least manages to tie it together with the crystal square that appeared many times before. I'm more impressed with the dialog, which felt true to each individual character and brought out natural conflicts stemming from their diverse personalities. This was even more fun to watch than the combined battle scenes, because it really did feel like a hodgepodge assemblage of personalities. The fights were cool as well, but again that's an expected attribute for a superhero film such as this. I wish they'd put in more scenes with the characters chatting together, because that's where the entertainment gold was. I didn't care much for the SHIELD people, as they remained colorless and peripheral. Even the guy who died, despite being a familiar face from the other movies, was largely forgettable. 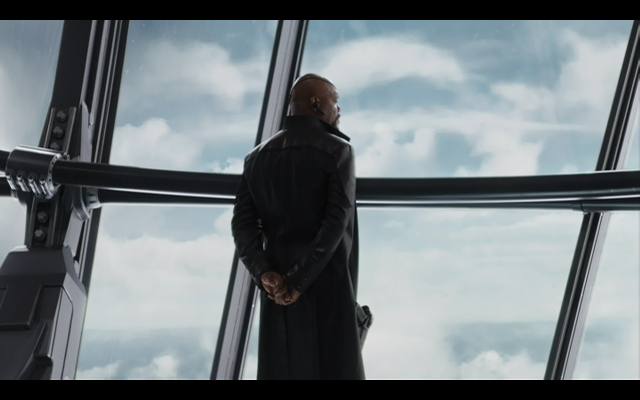 Nick Fury is also a total waste of Samuel Jackson's charisma, because he doesn't do much except lecture at screen-fulls of old people and stare about with one eye. I'm still not clear on who he is and what he stands for, which may be intentional but prevents me from feeling very much for his character. Some things that could have been improved include the soundtrack and the overall villain plot. The music here is largely forgettable and didn't do anything to enhance the scenes. 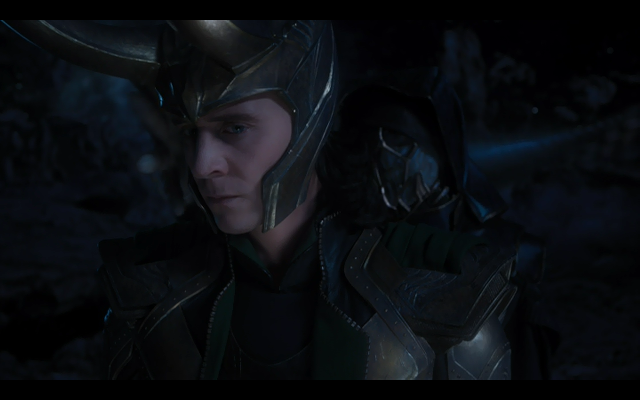 Additionally, I couldn't take Loki seriously as the "big bad", because he just comes across a scrawny misfit. I like what I see of the actor in offscreen interviews than I do in character. Offscreen he has so much poise and charisma (and has the most melodic, perfect voice), but onscreen he feels stagnant and lacking in presence. I never saw him as a true challenge to the Avengers, and frankly the entirety of his strength was dependent on his ice alien relations rather than his own prowess. Joss Whedon mentioned in his commentary that he initially wanted to add two villains for fear that Loki wasn't enough, and I think the film might have benefited from that. But of course, there's no reason to copy the Batman equation, and it's perhaps wise for this franchise to avoid drawing further comparisons. Overall, I would recommend it if you enjoy ensemble action films, and if you've watched the previous films. I'm interested enough to see any future sequels they spin out, though probably not enough to run out to theaters to watch them. And of course, I'm sure most of you know about Marvel's propensity to throw in secret endings during the credits that tease at future movies. From what I've read, the red-faced alien who appears at the end will be Thor's next villain and will be working to steal a gauntlet. 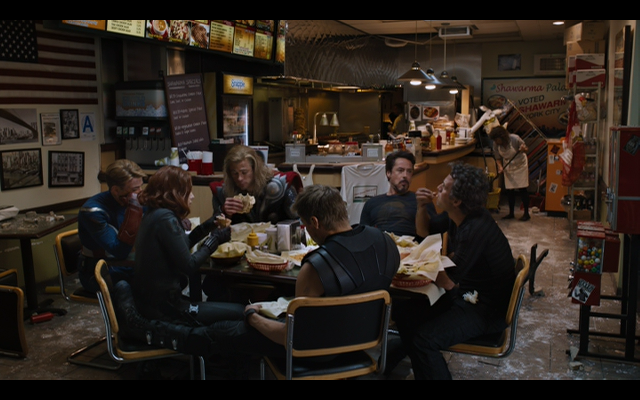 And while this was a pretty standard foreshadow scene, the Shawarma scene was ridiculous. The movie had some good gags overall (notably Thor being pushed repeatedly out of scenes), but this really takes the cake. It's the perfect combo of dry humor and plot acknowledgement.